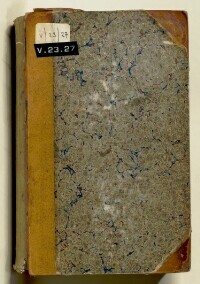 The record is made up of 1 volume (48 folios). It was created in 1876. It was written in English. The original is part of the British Library: India Office The department of the British Government to which the Government of India reported between 1858 and 1947. The successor to the Court of Directors. Records and Private Papers. Administration report of the Persian Gulf Historically used by the British to refer to the sea area between the Arabian Peninsula and Iran. Often referred to as The Gulf or the Arabian Gulf. Residency A diplomatic office of the British Government established in the provinces and regions considered part of, or under the influence of, British India. and Muscat Political Agency An office of the British Government and, earlier, of the East India Company. 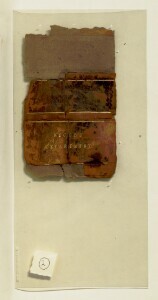 for 1875-76, published by Authority at the Foreign Department Press, Calcutta [Kolkata], 1876, and forming part of the Selections from the Records of the Government of India, Foreign Department (no. 128). The administration report is based on reports sent by the Political Resident A senior ranking political representative (equivalent to a Consul General) from the diplomatic corps of the Government of India or one of its subordinate provincial governments, in charge of a Political Residency. in the Persian Gulf Historically used by the British to refer to the sea area between the Arabian Peninsula and Iran. Often referred to as The Gulf or the Arabian Gulf. (Lieutenant-Colonel Edward Charles Ross) and the Political Agent A mid-ranking political representative (equivalent to a Consul) from the diplomatic corps of the Government of India or one of its subordinate provincial governments, in charge of a Political Agency. at Muscat to the Government of India. 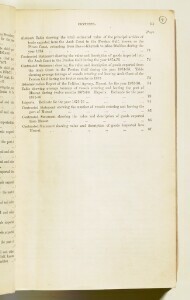 The report is preceded by a copy of a letter sent by Captain William Francis Prideaux, Officiating Political Resident A senior ranking political representative (equivalent to a Consul General) from the diplomatic corps of the Government of India or one of its subordinate provincial governments, in charge of a Political Residency. in the Persian Gulf Historically used by the British to refer to the sea area between the Arabian Peninsula and Iran. Often referred to as The Gulf or the Arabian Gulf. , to the Officiating Secretary to the Government of India, dated 5 July 1876, which enclosed the submission of the original reports to the Government of India (folio 8). Part 1: Administration Report for 1875-76 (folios 8-10) signed by Ross, dated 6 April 1876, and arranged under subheadings as follows: General; Petty Chiefdoms (Oman Coast); Bahrain [referred to as Bahrein throughout]; Nejd [Najd] and El Katr or Guttur [Qatar]; the Persian Coast; Bassidore [Bāsa‘īdū]; the Government of Fars and Shiraz; Establishments (political, medical, postal, naval), and the slave trade. 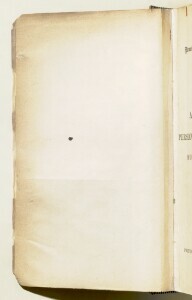 Part 2: Memorandum on the Governments and Districts of Fars for 1875-76 (folios 20-21), signed by Ross, dated April 1876, and arranged under subheadings as follows: I. Behbehan; II. Government of Bushire and districts; III. Government of Lar and Saba; IV. Government of Bunder Abbass [Bandar-e ʻAbbās]; V. Government of Dārāb; VI. Government of Iklid and Ābādeh; a list of governments or districts and collectorates of Fars not included in the six principal governments; Eeliat or nomad tribes of Fars; a list of places on the coast of Persian from Mashoor to Bandar-e ʻAbbās; a number of lists of the coastal ports and villages under different rulers in the different districts in Fars; details of the distance and staging points on the routes from Moghoo to Lar, Lingah [Bandar-e Lengeh] to Lar, Bandar-e ʻAbbās to Lar, and Ferozubad to Kerman through Fasa and Dārāb; a table of the revenue of Fars, supplied by Mirza Hassan Ali Khan, the Agent at Shiraz. 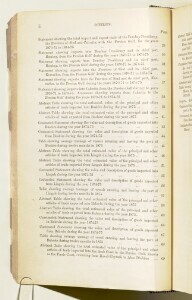 Part 3: Memorandum showing number of Returns accompanying the Trade Report of the Residency A diplomatic office of the British Government established in the provinces and regions considered part of, or under the influence of, British India. , Persian Gulf Historically used by the British to refer to the sea area between the Arabian Peninsula and Iran. Often referred to as The Gulf or the Arabian Gulf. (folios 21-44): a series of twenty-seven statistical tables containing data on imports and exports in the Persian Gulf Historically used by the British to refer to the sea area between the Arabian Peninsula and Iran. Often referred to as The Gulf or the Arabian Gulf. ports of Bushire, Bandar-e Lengeh, Bahrain, and the Arab Coast. There is an index of the statistical tables on folio 21. Part 4: Administration report of the Political Agency An office of the British Government and, earlier, of the East India Company. , Muscat, for the year 1875-76 (folios 44-46), prepared by Lieutenant-Colonel Samuel Barrett Miles, Her Britannic Majesty’s Political Agent A mid-ranking political representative (equivalent to a Consul) from the diplomatic corps of the Government of India or one of its subordinate provincial governments, in charge of a Political Agency. and Consul at Muscat. The report is chiefly a summary of political events over the year in Muscat, with additional, brief summaries: on personnel changes at the Agency An office of the British Government and, earlier, of the East India Company. ; the slave trade; general trade, with figures for the value of trade exports and imports, expressed in dollars; climate; customs. Part 5, prepared by Miles (folios 47-53) comprises six statistical tables containing trade data relating to Muscat: average tonnage of vessels entering and leaving the port of Muscat; imports and exports, listed by commodity; and contrasted statements on vessels and imported goods. The report is arranged into five parts (I-V), each of which is subdivided into a number of smaller sections by headings and subheadings. 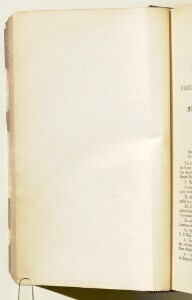 There is a contents page at the front of the report (folios 6-7), which refers to the report’s internal pagination sequence. Foliation: There is a foliation sequence, which is circled in pencil, in the top right corner of the recto The front of a sheet of paper or leaf, often abbreviated to 'r'. of each folio. It begins on the first folio with text, on number 5, and ends on the last folio with text, on number 53. Pagination: The volume contains an original typed pagination sequence.